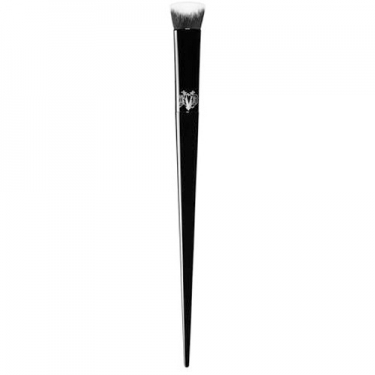 DESCRIPTION: Lock-It Edge Concealer Brush from Kat Von D is a high performance broach brush with a unique sculpted shape that blends seamlessly with the eye corrector and instantly covers the imperfections. This unique and custom brush design features a sculpted shape that conforms to the unique curves and contours of the face. It fits perfectly in the area of the eyes and also concentrates coverage on spots on the face. Symmetrical conical bristles and a consistent and consistent average density provide 360 degrees of accurate and uniform blend. Designed for high wear and high pigmentation formulas, such as Lock-It Concealer Cream, this brush optimizes the coverage, wear and finish of your concealer. The excellent quality synthetic bristles perfectly match the concealer, either under the eyes or elsewhere on the face.